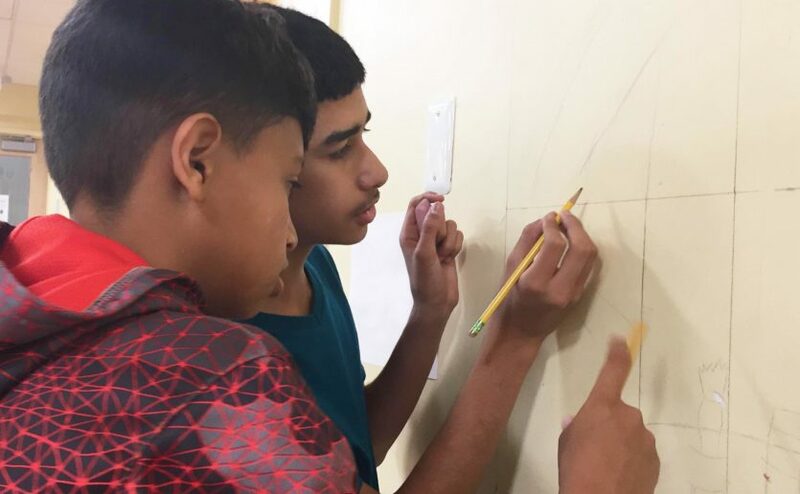 At the MGH Revere HealthCare Center Youth Zone, two campers layout the design for a full-sized wall mural. Offered by the MGH Revere HealthCare Center, the Youth Zone program offers kids a place to grow, learn and have fun during the summer. During the summer of 2018, scores of young people, ages 9-17, are keeping cool at the MGH Revere Youth Zone summer camp. From July 2 to August 10, as part of its “surf, sail and summits” theme, campers are swimming, sailing and hiking the days away. A Youth Zone camper enjoys the camp’s literary lounge. Two decades ago, Debbie Jacobson, administrative director of the MGH Revere HealthCare Center, envisioned a space where youngsters could come after school and during school vacations to socialize, learn and have fun. Twenty years later, the Youth Zone is housed in a beautiful, expanded space easily accessible by foot, bike or bus. Mindful of the childhood obesity epidemic, Youth Zone staff are very focused on keeping kids off of devices and on the move. Campers enjoy soccer, basketball, football, tennis and track, and have the opportunity to take sailing lessons on Boston Harbor. Field trips this summer include outings to Canobie Lake Park, Blue Hills Reservation, the Manchester Athletic Club, the Museum of Science, the Museum of Fine Arts, sailing aboard the Schooner Adventure in Gloucester and a visit with Revere Mayor Brian Arrigo. Campers enjoy healthy cooking classes, gardening, art lessons, yoga, book club, salsa lessons and the healthy lifestyles program, Stay in Shape. The Youth Zone is partly funded by donors including the Ladies Visiting Committee. It also benefits from individuals and organizations such as MIT, Harvard University, the Berklee School of Music, the Massachusetts College of Pharmacy & Health Sciences, Whole Foods, the Suffolk County District Attorney’s Office and Boston MedFlight, who donate their time to give presentations at the camp. The MGH Revere HealthCare Center is part of Mass General’s Center for Community Health Improvement (CCHI), which builds relationships and works with community partners to make measurable, sustainable improvement on challenging health problems. CCHI carries out its work in Chelsea, Revere and Charlestown, where Mass General has maintained healthcare centers for more than 40 years. CCHI programs also work with Boston youth and special populations such as the homeless, immigrants and refugees to improve their health status. For more information about how you can support the Center for Community Health Improvement, please contact us. For more information about the MGH Revere Youth Zone summer camp, please contact Leslie Heffron, RN, manager of Youth Services at the MGH Revere HeathCare Center. This story first appeared in Caring Headlines, a publication of Mass General’s department of Nursing and Patient Care Services.